As a stay-at-home mom of two beautiful children, I’ve been using knives for as long as I can remember to cook, prepare BBQs, and whatnot. From my long experience, the biggest complain I have about them is that they need sharpening all too often. After using steel knives for decades, I was introduced to ceramic knives by a friend and was immediately hooked. That Kyocera knife was the best ceramic knife I ever used, including every other variation of cutting tools. Since then, I have had experience of using many more ceramic knives, from which I have made a list of the best ones. If you’re looking to give ceramic knives a try, this list is a good place to find the best picks for you. What is the difference between ceramic knives vs steel? 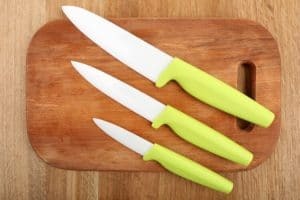 Can I use a ceramic knife as an alternative to all my kitchen knives? Are ceramic tools hard to maintain? How to get my ceramic one sharpened? How sharp are ceramic cutting tools exactly? My steel knives are dishwasher-safe. Can I use ceramic ones the same way? I heard these knives are way too fragile. Is that true? Will they shatter if I accidentally drop them on the floor? Do I need to buy any additional accessories with a new ceramic tool? What are the chances that my ceramic tool with catch rust or stain? I have seen a few ‘ceramic-coated’ steel knife in the market. They look pretty much the same as the ceramic tools you mentioned. Should I buy those? Within a budget, this one from Checkered Chef can be the best ceramic chef knife set for you. With this beauty, you get four different blades (3”, 4”, 5” and 6”) complemented by easy-grip handles and finger guard. As a bonus, you’ll also get a pair of scissors and a holder to go with the set. There are few things that give your kitchen a modern, sleek look than a natural knife block. 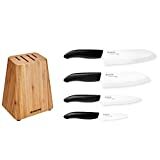 With the Bamboo Knife Block Set from Kyocera, you get four of the company’s bestselling knives alongside a block built out of natural, solid bamboo. 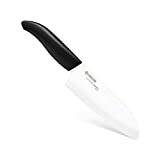 The four ceramic knives – paring (3”), utility (4.5”), Santoku (5.5”), Chef’s (6”) will take on pretty much any vegetable, boneless meat, and fruits you throw at them. As far as types of ceramic knives go, you can get pretty much any type of kitchen knife made out of ceramic. There are ceramic fillet knives, chef’s, paring, utility, Santoku knives, and so on. However, there’s a major difference between ceramic knives and regular ones, say, made out of steel. Ceramic cutting tools are not meant to replace your regular knives, rather, they are meant for specialized tasks, like chopping vegetables, boneless meat, and other soft ingredients. With its incredibly sharp edges, you’ll get fine cuts from the top ceramic knife every time for a long period of time. But for cutting through harder materials, we suggest you use steel cutlery instead. For the best ceramic knife brand, it is hard to rival Kyocera. There are other manufacturers too, like Vos, Zyliss, MoiChef, and Checkered Chef, all producing single knives and knife sets. The first thing to ask yourself before buying a ceramic tool is – why do you need one? Are you looking for a specialized knife for selected tasks like cutting vegetables, or do you need an all-purpose knife? 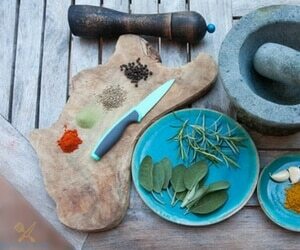 Always remember, ceramic tools are more suitable for materials like boneless meat and vegetables, and they are not a magical, super sharp tool that will replace all your kitchen cutlery. 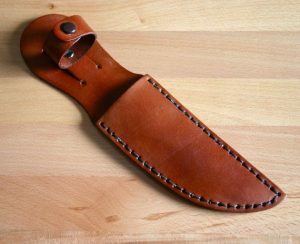 Do the knife you’ve selected come with a sheath/cover or not? Since ceramic knives can chip and break under pressure, it’s best to store them in a sheath for protection, especially the tip. If your knife does not come with one, I suggest you buy an additional sheath, or even better, a full-on knife block. Since these knives are incredibly sharp, it helps if the handle is designed for better control. For this reason, look for the models that come with an ergonomic design and good grip. Usually, non-slip rubber grips are the best, followed by nylon and plastic ones when it comes to comfortable gripping. Ergonomic design, on the other hand, will help you get more cutting done with less effort. It helps if there are ridges for resting your fingers, but it not an absolute must. 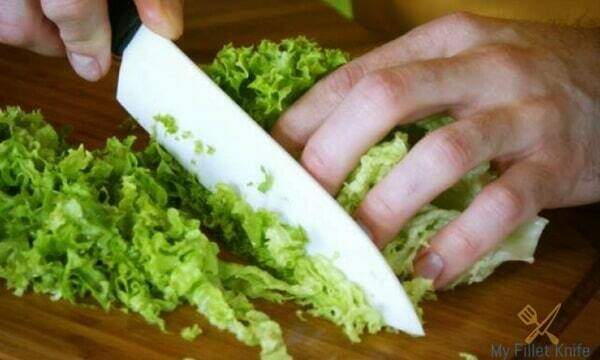 Cutting your fingers under a knife is not a very pleasant experience, I can tell you that from personal experience. If there’s a finger guard under the handle right over the blade, it’ll save your finger from all those nasty cuts. 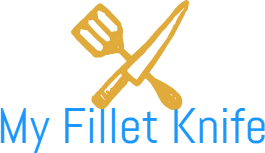 For example, Checkered Chef has a knife whose handle has an extended ridge right under the blade where you might put your finger accidentally when trying to apply more pressure. That little detail has saved my fingers so many times! Ceramic knives are notorious for how hard it is to find a sharpening facility for them. Always make sure that either the manufacturer of your knife has after-sales sharpening services, or there are after-market agents in your area to sharpen knives. If not, you might end up with a dull knife after a couple of years. Ceramic tools bring with them a number of amazing benefits, as I’ve discovered from my long-time. It’s hard to pick just five points from all the upsides, but I’ve tried to list the most important ones here. Ceramic knives are unbelievably sharp and can cut through vegetables, boneless meat, and even cold butter, like hot butter. If you want clean, accurate cuts, ceramic tools are the way to go. Compared to steel knives, ceramic ones are a featherweight. They weigh a fraction of your regular knives and are extremely easy to maneuver around. You haven’t yet experienced the incredible joy of cutting through heaps of veggies with no effort if you don’t use a ceramic tool. As mentioned before, one of the biggest drawbacks of steel knives is that you need to sharpen them all too often. A knife made from ceramic, on the other hand, needs almost no sharpening at all during the better part of its lifetime. Some people even go year after year with regular use and without ever sharpening their ceramic tools. This is a point I cannot stress enough. Ceramic knives produce cuts so precise I didn’t even know were possible. This holds especially true for cutting through boneless meat, as I’ve seen on my BBQ expeditions. If sharp cuts are your thing, it’s time to get a ceramic tool. Unlike metal knives, ceramic ones do not catch rust or stain. As a result, they require very little maintenance to be kept in top form. All you need to do is hand-wash them and store safely, possibly in a sheath so that it does not break or chip. This is pretty much the first question any new ceramic knife buyer would ask. The answer is simple – steel knives are tougher, more durable, can take on tremendous pressure, and cut through harder materials. On the other hand, even the top ceramic knife is brittle, can chip and break while applied to harder materials, but can make very precise, clean cuts through materials like vegetable and fruits. If you want finer cuts, ceramic is the way to go. You technically can, but we suggest not to. Even the best ones are meant to compliment regular steel knives, not replace them. For some knives like a fillet one, using a steel knife is much better. While ceramic ones can be extremely sharp, they are not suited for cutting a lot of ingredients, such as meat with bones, tough fruits and vegetables, and even things like hard cheese. Rather, it is best you have a set of ceramic ones alongside your regular knives to get the best culinary experience. Not at all. They are very low maintenance – all you need to do is clean them by hand, and store in a good storage option, possibly in a sheath or a knife block, so that they don’t chip or break. However, as mentioned before, these tools can chip and break under pressure, so there might be a little learning curve while using these knives for the first time. Believe it or not, ceramic is such a tough material that you actually need a diamond sharpener to sharpen these knives. While these sharpening tools are available for you to buy, most of the time, you’ll need to send your knife back to the manufacturer to restore it to peak sharpness. There are some authorized sharpening dealers out there, but they are too far and between. But luckily, the good thing is the top knife usually don’t need sharpening for a long, long period of time. Extremely sharp. They can be up to 10 times the sharpness of regular stainless steel blades – so you get the idea. Be extra careful when using these knives, or you may accidentally cut yourself. From my own experience, I can tell you that I’ve been cut once or twice by these tools, entirely because I was either not paying attention or holding it at a bad angle. But it’s not more of a risk than using a regular knife, I can tell you that! The short answer is no, you shouldn’t. The long answer is that usually dishwashers rattle and twirl objects inside for washing. The ceramic blade of these knives might accidentally shatter if they are twisted or put under pressure by the dishwasher. It is better to wash them by hand for a cleaner knife, as well as to increase their longevity. That is not necessarily true. These tools can chip if you try to cut through bone, or the handle might come off if you try to pry instead of cutting. As for dropping them on the floor, if you drop them on the tip, it might chip just like regular knives. But ceramic cutting tools from reputed manufacturers like Kyocera and Checkered Chef will never shatter on impact. Not really. Most ceramic ones these days come with accompanying covers or sheaths. However, you might want to invest in a knife block and a chopping board. A knife block, especially the natural-looking bamboo ones or the marble/granite ones not only look good, but they keep your cutlery safe from the elements as well. On the other hand, to ensure your ceramic cutting tool remains in top form, you should look for either a wooden or a plastic chopping board. These prevent chipping while cutting and help retain the sharpness of your tool. The best thing about these knives after their sharpness is perhaps their build factor. As you probably know already, these are made from zirconia and other elements related to ceramic, which do not react to acid, saltwater, or pretty much any everyday corrosive agent. a result, these cutting appliances are great for saltwater fish, fruits, and any other soft ingredient that your steel knife can’t handle. Please don’t! Do yourself a favor, and avoid those. While they may actually come with a ceramic coating over the steel blade, they have none of the best features of a ceramic one, aside from the look. If you want a truly good cutting experience, please buy the real deal, even if it means shelling out a few extra bucks. With a three-piece set – a chef’s, a tomato, and a paring knife – the Advanced Ceramic Revolution from Kyocera is an all-in-one solution for your cutting needs. With the chef’s knife, you can your daily slicing, chopping, and dicing is done. The tomato knife is used for slicing very thin layers of tomato and other fruits, while with the paring one, you can easily peel and slice smaller fruits. Made out of zirconia, the blade is nearly 10 times sharper than your usual steel, holds sharpness exceptionally well, and offers consistent performance through a great ergonomic design. Dalstrong is famous for its handcrafted ceramic blade, and its Ceramic Chef Knife holds up that reputation. This ultra-light tool retain an incredible 15-time more edge than steel, and gives you a clean, healthy cut like never before. The blade is also germ, rust, and BPA-free. This good looking knife can definitely be a great gift item for your loved ones! 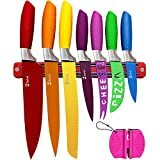 Add a little color to your life with this 6-piece knife set from Cuisinart with individual covers. This set covers pretty much all the cutting tools you might need in the kitchen, including perhaps the best ceramic bread knife, and color-codes them for easy sorting and your ease of use. The color coding is particularly useful if you have a variety of items on your everyday menu, as it is very easy to switch between knives between tasks. If you’re looking for a ceramic cutting set within a budget, this great set from Checkered Chef can be a great pick for you. With four different blade sizes and great cutting performance, it really is the best deal within its price range. Anti-corrosion, rust and bacteria blades, and ergonomic grips with finger-guard – what’s not to like about this set, right? This beautiful knife set from Oliver & Kline rolls utility and style in one smooth package of three ceramic knives. You get all the benefits of ceramic tools – extreme sharpness, low maintenance, and resistance from the elements. As a bonus, you’ll also get a sleek magnetic box with the knives, which makes it a perfect gift package for your loved ones. This cutting set from MoiChef will not only deliver supreme performance but will add a splash of color to your kitchen décor too. Color coded for your ease of use, the four ceramic blades of this set comes with accompanying covers. These are very lightweight to use, and hold sharpness for a long, long period of time. Another colorful set on this list, you get what is actually advertised with this Chefcoo classic. There are seven knives, one sharpener, and a magnetic holder to take care of all your kitchen cutlery needs. Its color-coded non-slip handles will not only make your life easier but make your kitchen time fun again. If you’re looking for an all-in-one knife set within a budget, look no further than this beautiful collection of cutting tools. Another great knife from MoiChef, this Chef’s Knife is a premium cutting tool that ticks all the right boxes. Ultra-sharp? Check. Lightweight? Check. Ergonomic handle? Check. You’ll also get a white sheath to keep your knife in top-notch form during storage. Neat, right? This great little Santoku knife from Kyocera gives off a premium look and feel in the first impression, and its performance backs that impression quite well. According to Kyocera, its blade comes with microscopic precision, and the smooth, precise cuts it provides just proves that point. Impervious to elements like oil, salt, and even acid, this is one of the top-notchSantoku knives in the market right now. For a lightweight cutting tool at only 3.5 inches, this paring knife from Zyliss is easy to use, control, and maintain. Its carbon-high steel blade holds sharpness over long periods of time, which is well-complemented by a soft rubber grip. For cutting through vegetables and fruits, we suggest you keep this on your wish list. 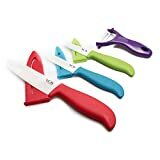 This set from Vos is a colorful, versatile collection that contains three knives, their respective covers, and a peeler – all made out of ceramic. 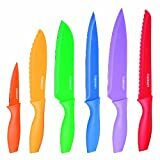 The knives are color-coded to save your time and effort, and with a lightweight, you get all the usual features from ceramic knives like sharpness and long-term edge retention. Oh, Vos will give you a sleek, stylish box with the set too! If you’re looking for a complete knife set that delivers on the performance and brings a breath of nature to your kitchen at the same time, then you’ve probably been looking for the Bamboo Knife Block Set from Kyocera. Its four knives are the company’s bestselling models, encased in a block made of natural bamboo. With rubber feet securing the block, this can be the elegant solution you’ve been looking for your kitchen all along. 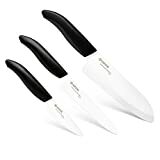 AS for our recommendation, we suggest the Checkered Chef Ceramic Kitchen Knife Set if you’re within a budget. There are four different blades (3”, 4”, 5” and 6”) in this set, along with a pair of scissors and a holder to keep all the tools. The Kyocera Bamboo Knife Block Set will give your kitchen a modern, sleek look with four of the company’s bestselling knives alongside a block built out of natural, solid bamboo. The four ceramic knives will take on pretty much any vegetable, boneless meat, and fruits you deal with every day. For a cutting tool with extremely sharp edges, a ceramic knife is almost in another league compared to steel knives. A ceramic chef knife can cut through materials like boneless meat, bread, and vegetables like hot butter. Although they need a little careful use to prevent chipping, the silky, buttery smoothness of everyday cutting weighs out pretty much any negative about it. If you don’t already have one, pick one from our best ceramic knife review, and we guarantee you, you’ll be in for a real treat.